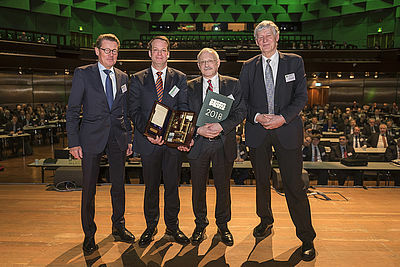 During the opening of the 29th IKV Colloquium, the Association of Plastics and Rubber Machinery Manufacturers in the VDMA (German Engineering Federation), along with PlasticsEurope Deutschland and the Association of Sponsors of the Institute of Plastics Processing (IKV) in Industry and the Skilled Crafts at RWTH Aachen University, awarded the Georg-Menges prize for the eleventh time. 850 plastics experts from throughout the world attended IKV's 29th International Colloquium Plastics Technology. The Georg-Menges prize 2018 was won by INTRA – the Interest Group of Innovative Enterprises for Plastics Engineering in the Aachen Region. The prize, which consists of a replica of a hand-made monocular Leitz microscope from 1899 built in Wetzlar, has been awarded since 1999 by IKV, VDMA and PlasticsEurope. This year is the first time an institution and not a person has received the award. The Georg-Menges prize is awarded for outstanding application-related achievements in research and engineering in the field of plastics processing over the last decade. It aims to encourage dialogue and cooperation between industry and research, and to create a communicative and cooperative climate between them. Against this background, the jury decided to award this year's Georg-Menges prize to INTRA. The Interest Group of Innovative Enterprises for Plastics Engineering in the Aachen Region (INTRA) is an association of companies founded predominantly as spin-offs from IKV. INTRA was established in1999 to make the expertise in plastics that exists in the region of Aachen better known. Since it was founded, INTRA's aim has been to support the courageous sense of entrepreneurship that is always behind a spin-off. INTRA pools the high concentration of know-how and creates synergies as a result. This strengthens not only the region but also each individual company. The INTRA companies operate in the following fields: consulting, design, measuring technology, software, PR services, research and development, materials technology, production and quality assurance. The Georg-Menges prize 2018 especially honours this start-up culture and the support of young companies by INTRA. The laudatory speech was given by the Rector of RWTH Aachen University, Prof. Dr.-Ing. Ernst Schmachtenberg. On behalf of INTRA, Dr.-Ing. Erwin Baur, Managing Director of M‑Base Engineering+Software GmbH and a member of the Board of INTRA, accepted the prize.